The KEAM Trial Allotment Result 2017 has released today. Candidates seeking admissions into Engineering & Agriculture Courses can check the trial allotments. 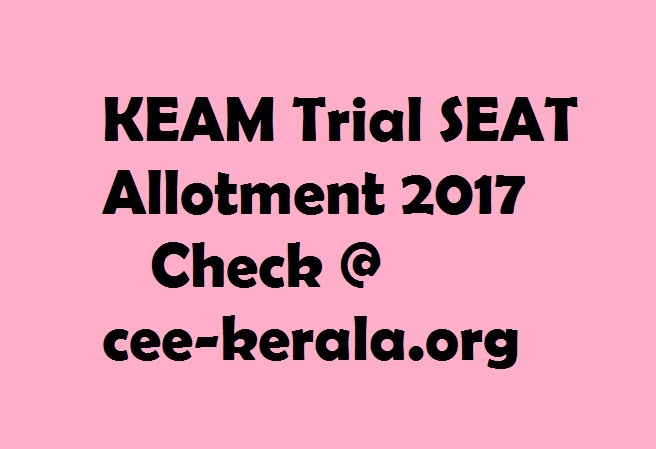 Aspirants are supposed to check KEAM 2017 Seat Allotment from official web portal at cee-kerala.org. The allotments are made through a Single Window System of the Centralized Allotment Process (CAP). NOTE: KEAM 2017 — Option registration time for Engineering/Architecture/Pharmacy courses is extended upto 3PM on 29-06-2017….. Trial allotment is re-scheduled on 28-06-2017 10PM……..
As per the schedule, First Round Allotment will update soon. Meanwhile, students can check CEE Kerala Trial Allotment Result 2017. The admission process is available in the online. Aspirants log in to the official portal to check KEAM Seat Allotment 2017 Result. The seats will allot basing on +2 marks for various courses. The Commissionerate of Entrance Examination (CEE) conducts Kerala Engineering Agriculture Medical to provide admissions into various professional courses. Kerala Engineering Agriculture Medical Degree (KEAM), 3 LLB, 5 LLB, LLM, PG Ayurveda, PG Homoeo, PG Nursing, PG Medical and Super Specialty is offered through CEE. Now, they have released KEAM Trial Allotment Result 2017. The KEAM 2017 Exam is conducted in the month of April 2017. The total 90806 candidates appeared in Engineering and 72440 were qualified in the test, for Pharmacy 24996 candidates appeared the test and only 21349 qualified. As per the schedule, on May 18 KEAM 2017 Result has declared. Now, who have registered for filling the choice can check KEAM Trial Allotment Result 2017. The First Allotment is schedule on June 30. There total 54604 seats in the stream of Engineering in 159 colleges across the State. In the KEAM First Seat Allotment admission will be open for 33000 seats. The direct link of KEAM Seat Allotment 2017 Result is available in this page. Candidates have to check the schedule of First Round Allotment that will release on June 30. Therefore, more details of KEAM First Round Allotment 2017 Result may update soon.